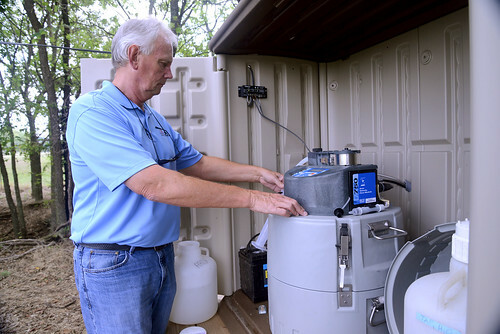 MONITORING — Andrew Sharpley, professor of crop, soil and environmental sciences, calibrates an automated water sampler for a sampling site along a stream at the border of a Washington County farm field. (UA Division of Agriculture photo by Fred Miller) Credit mandatory. Soil scientists will celebrate the 350thanniversary of the discovery of phosphorus during a conference of the Soil Science Society of America in January 2019, said Andrew Sharpley, Distinguished Professor of Soils and Water Quality for the University of Arkansas System Division of Agriculture. It was the 13thelement, and the first discovered by scientific methodology. Brandt distilled phosphorus from a copious store of human urine — it took about 290 gallons to produce a little more than 2 ounces of the stuff. Phosphorus is inextricably linked to human society since the industrial age, Sharpley said. It has moved beyond its agricultural uses and has become essential to many industries. Most commercial phosphorus comes from mineral mines, Sharpley said. It’s a finite resource, though estimates on when easily available sources run out vary widely. Phosphorus from animal manure has long been used for agricultural fertilizer, Sharpley said, but as animal agriculture has become uncoupled from plant agriculture, some areas see overabundance while others see shortages. The problem is a global one, he said. “We face a conundrum of coincident consequences of phosphorus deficiencies and excesses,” Sharpley said. Sharpley said 2019 will be a good time to envision the next 350 years of research and discovery. “The 350thanniversary of our relationship with phosphorus presents an ideal vantage point from which to consider where we have been, where we are, and where we should take this relationship,” Sharpley said. Phosphorus is an essential nutrient for agricultural crops, Sharpley said, but it can become a problem when too much of it builds up in soils. Under some circumstances, rainwater can move phosphorus from dry land into bodies of water, where its nutrient properties may result in explosive growth of algae and reduced water quality. “Our research faculty are involved in tackling these issues, collaborating with scientists at other universities and in other countries to tackle the issues worldwide,” Sharpley said. Division researchers in the Arkansas Agricultural Experiment Station have long studied phosphorus management in Arkansas, Sharpley said. The results have included comprehensive best management practices that sharply reduce the risk of runoff. Ongoing research continues to refine those practices, Sharpley said. The Division of Agriculture partners with Arkansas farmers on Discovery Farms, where where nutrient use, including phosphorus, is monitored, Sharpley said. New management methods are tested on those working farms to determine their effectiveness in reducing or eliminating nutrient loss. Division of Agriculture scientists are investigating new conservation methods and new ways of using old methods, Sharpley said. Such research includes the use of reduced tillage and cover crops. Sharpley said these practices act by protecting the surface of the soil and reducing erosion. Such practices not only help prevent nutrient loss, Sharpley said, but also help build up organic matter and sequester carbon, improving soil health and reducing agriculture’s carbon footprint. The Discovery Farms and other research documents their effectiveness for conserving nutrients and allowing farmers to use less fertilizer. Research data is provided to agencies like the National Resource Conservation Service that uses it to develop regulatory measures that reduce environmental impacts. Sharpley said division scientists follow up to measure the effectiveness of those practices. Sharpley said scientists are also looking toward a future where mineral phosphorus reserves are no longer available. Scientists are already looking at more efficient ways to extract phosphorus nutrient from manures and use them as a beneficial byproduct, he said. To learn more about Division of Agriculture research, visit the Arkansas Agricultural Experiment Station website: https://aaes.uark.edu. Follow us on Twitter at @ArkAgResearch.